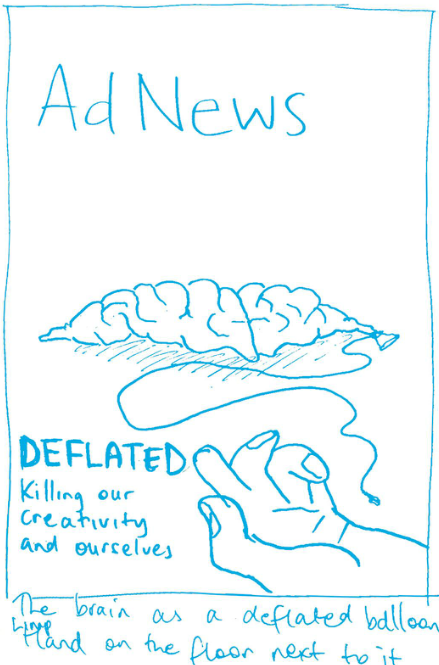 The creative contingent of adland is the beating heart of the industry. To fully embrace this, and with a mission to create awesome and inspiring covers, each month AdNews hand-picks an agency to work its magic. To reflect this issue’s feature that looks at mental health across the sector, it seemed the perfect fit to involve the Youngbloods, a not-for-profit group of young talent which aims to empower a new generations of professionals, “to kick arse in advertising”. 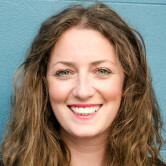 An industry committee powered by The Communications Council, the members are largely aged 30 and under and work within some of the country’s top agencies, including The Monkeys, Saatchi & Saatchi, The Brand Agency, Publicis, CHE Proximity and more. Recently, Youngbloods shook up its internal structure from being four disconnected states, working separately with different missions, to a national, more cohesive structure. AdNews spoke with Youngbloods to find out about the process of creating the cover, what the group stands for and why mental health is such an important issue. What were your initial thoughts on the mental health feature brief at hand? Creating awareness around mental health in our industry is a focus for Youngbloods and a number of states had officially endorsed the Mentally Healthy study (the first major study into mental health within the media, marketing and creative sector, released late last year). So, it seemed like the perfect match. This is an important issue and we were really pleased just to be involved with this feature in some capacity. Post–first brief chat, what went through your mind? It was a lot of fun to be working with the other states and seeing what some of the industry’s top young creative teams came up with. Many came up with multiple concepts, which was great to see given the timeframe, and this made shortlisting the most powerful concepts a welcome hurdle for the Youngbloods committee. Who from the Youngbloods were largely involved? Spencer Ratliff (The Monkeys – VIC) took on the task of writing the brief and enlisted the help of national chairs, Matt Gardener and Sarah Kappeler, to organise a video call to brief teams from VIC, NSW, QLD and WA. From there, each state submitted their entries with Spencer, Matt and Sarah selecting the concept they felt best answered the brief. Lachy Banton and Niall Stephen (The Brand Agency) from WA were the team whose concept stood out immediately and were then given the green light to move into production. How did you know you’d landed on the best concept? 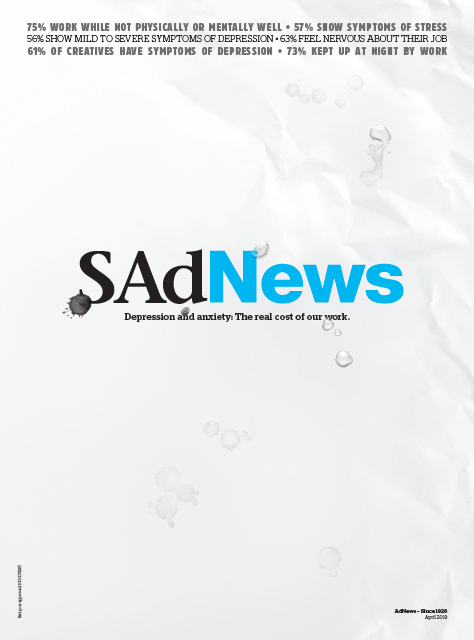 The winning concept — SAdNews — is an incredibly simple, cutting and balanced idea. At the core its clever, format–breaking wordplay really effectively summarises our feelings towards the report’s findings. The sub-line then succinctly drives home our stance on the issue, and when paired with the visual treatment, we felt culminated in a powerful cover. Why does mental health need to be a priority for the industry? For an industry that relies on forward-thinking and creativity for success, creating an environment that promotes positive mental health and well-being is a no-brainer. This is an issue that plagues not only our industry but society as a whole and should always be paramount; nothing is more important than your health! What were the biggest hurdles to making this a reality? Any challenges ? The logistics of farming the brief out to each state was a bit of a hurdle, given everyone’s schedules, then having to choose just one concept. There were so many great replies to the brief, so that was a good challenge to have. Tell us about the actual creation techniques. How did it come together? We wanted a concept that spoke to the frustration and self-doubt that sometimes reveal themselves on the job. The wordmark was the perfect platform for this, so we made it the focal point of the cover. With the reader holding the magazine in their hands, they’re instantly transported to that vulnerable place where emotions begin calling the shots, which is indeed sad news. Biggest challenge with the whole process? Did anything keep you up at night? Ironically, it did keep a few of us awake at night, but thankfully not for too long. It’s an issue we all feel pretty strongly about — mental health is so vital to not just our industry, but all industries — so we just wanted to make sure we did it justice. Best bit about the process? Aside from being given the opportunity to pitch a cover concept alongside creatives from across Australia, the best bit about the process was knowing we’re helping to shed light on such an important topic. Tell us more. Who are the Youngbloods? Formally, the line is “people in advertising under 30 years old”, however, with the shape of our industry changing rapidly, and people entering it at all different stages of their life, our renewed focus is on anyone in an advertising, marketing or creative agency, in their first five years in the industry. What is the Youngbloods’ mission and why? Youngbloods is a not-for-profit collective of advertising professionals across Australia, who believe the best way to be great is to help each other. We’re for people new to this industry and are run by those people, enabling us to always keep our finger on the pulse. We’re here to empower new generations of professionals to kick arse in advertising by creating and facilitating a world-class journey through the industry. We work towards this by developing events, content and partnerships that sit under our four key pillars (Nurture, Connect, Inspire and Guide). We’re pursuing this for a simple reason; we believe the power of young people’s fresh perspectives and new ideas can change our industry and our world, for the better. Why has the Youngbloods relaunched? The relaunch came as an answer to a simple question: “Could Youngbloods be more than it is; four disconnected states working separately with different missions?”. Alistair Stephenson (former chair of NSW committee) posed this question to the now national board in 2018 and set us on the path to answering it. This first appeared in the AdNews April 2019 magazine. 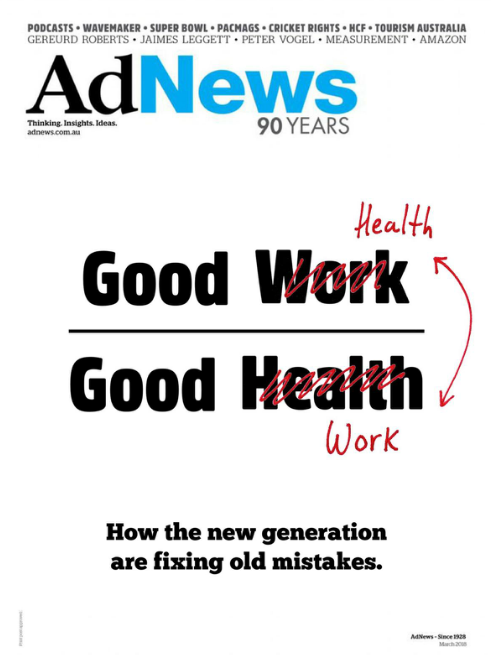 Support AdNews by subscribing here.